Each year since 2007, a handful of students have graduated from UNH a bit richer than anticipated due to the generosity of Dana Hamel, whose Hamel Scholarships Program distributes financial gifts to Granite State students every semester. The recipients of these gifts – the Hamel Scholars – are selected based on academic excellence, leadership and community involvement. 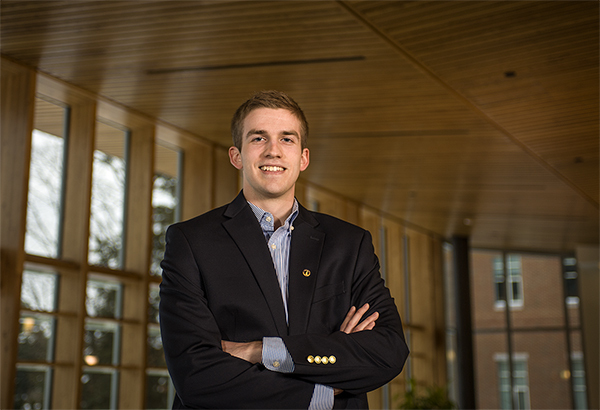 Kevin McAleese ’15 has been a Hamel Scholar since his sophomore year. He’ll graduate in May with a dual degree in international affairs and the double major of political science and economics. We checked in with Kevin to find out what’s next for this Hamel Scholar. The Republic of Azerbaijan is a small nation nestled in the Caucasus region, north of Iran, south of Russia and east of Turkey, Georgia and Armenia on the western shore of the Caspian Sea. It’s where Kevin McAleese ’15 spent eight weeks between his sophomore and junior years at UNH. He went there to study the Azerbaijani language after winning a prestigious Critical Language Scholarship from the U.S. Department of State. In the capital of Baku, he lived with a couple — an architect and an engineer — whose children were studying abroad. Neither spoke English, but that didn’t matter; McAleese spent five to six hours of every weekday in a classroom learning their language and then practicing it along with his six classmates during daily excursions around the city. By the end of six weeks, he knew enough to get by, and he traveled deeper into the country, visiting the beaches of Baku’s north side, hiking in the Caucasus Mountains and visiting cliffside villages along the way. Azerbaijan is one of many academic adventures McAleese has experienced during his time at UNH. In fact, if there is a prototypical college experience, it might be that of this Nashua, N.H., native, who will graduate with foreign language, study abroad, community service and on-the-job experiences. Oh, and an impressive academic record. He seems also to have an appetite for immersive experiences. Besides Azerbaijan, McAleese has been involved in Model UN (freshman and sophomore years) and Mock Trial (all four years). During his sophomore year, he became a senator in the UNH Student Senate, and in his junior year he became the Senate’s business manager. This semester, he’s taking four classes, working on two capstones and serving as the senate’s chief financial officer of the Student Activity Fee Committee, where he interfaces with the student organizations looking for a piece of the $1.3 million student activities budget. He’s also working part-time at Liberty Mutual – a gig he landed after handing a recruiter his resume at a UNH job fair a couple of years ago, which got him through the door as an intern last summer in the company’s Dover, N.H., office some 10 minutes from campus. And he's collaborating with other Hamel Scholars on service projects as part of the program’s community service component and conducting service work as a Lambda Chi Alpha brother. So much for coasting through your final semester. Earlier this month, McAleese took a break from classes and traveled to Florida to represent UNH as the student speaker at alumni events, including one where he was delighted by a surprise appearance from benefactor Dana Hamel. Law school might be in McAleese’s future, but for now he has his sights set on working, and in June he’ll begin a full-time job handling disability claims at Liberty Mutual. Hamel Scholars are funded through the generosity of Dana Hamel, a longtime supporter of UNH. Are you a New Hampshire high school student with good grades and strong leadership skills? Find out how you could receive a Hamel scholarship. Find out how you can help fund scholarships for UNH students. 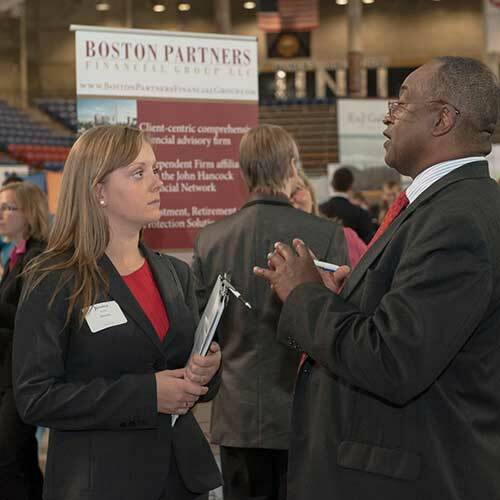 Get your foot in the door like Kevin did at a Career Fair. See where other UNH students pursuing an international affairs dual degree have studied on the UNH Center for International Education site. Find out more about fellowships and scholarships like the Critical Language Scholarship at the UNH Office for National Fellowships.